Information about operations, including flight paths, movements, runways, noise monitoring, investigations and complaints is now available through our reporting links. Access Gold Coast Airport online information. Airservices manages and controls the flight paths used by aircraft approaching and departing Gold Coast Airport. Flight paths are not precise, defined paths like runways, but more like corridors that are often several kilometres wide. Darwin International Airport is located within the city of Darwin, in the Northern Territory, and is a joint civil-military aerodrome. Darwin International Airport has noise abatement procedures in place which include preferred runway and preferred tracking directions. Additional noise abatement procedures apply specifically to the operation of fighter jet aircraft. Darwin International Airport is a military-controlled airport for which Airservices holds no detailed flight track data. Airservices and Defence recently performed a regular review of the changes that were made in 2015 and identified some minor adjustments that are required to ensure the highest level of safety assurance is achieved and that aircraft are managed as efficiently as possible. These changes will come into effect on 26 May 2016. The Community Aviation Consultation Group (CACG) is the primary forum for community engagement with airport management and other industry stakeholders. It is independently-chaired and meets three times per year. The purpose of the CACG is to ensure community views are heard by the airport and to provide members of the community with an opportunity to obtain information about airport operations. Airservices attends and actively engages in the Darwin CACG regarding changes to procedures or operations and to assist in discussions. Airservices is committed to identifying potential noise improvement opportunities at all airports around Australia. Noise management is controlled by aircraft noise abatement procedures and routine aircraft noise monitoring undertaken by Darwin International Airport and the Department of Defence. Royal Australian Air Force (RAAF) Base Darwin manages a toll-free noise enquiry hotline for any community complaints regarding military aircraft. Darwin International Airport and RAAF Base Darwin work in partnership to respond to any public concerns. Brisbane West Wellcamp Airport is a privately owned and built airport, located 17 kilometres from Toowoomba’s central business district and 120 kilometres from Brisbane Airport. The airport opened on 10 November 2014 with the first scheduled passenger flights on 17 November 2014. A mix of jet and propeller aircraft and helicopters are expected. The information provided below is to assist the community with information on how the airport and airspace will operate and where aircraft might fly. Airservices has published flight procedures for Brisbane West Wellcamp Airport, these procedures were not designed by Airservices. The airport will operate in uncontrolled airspace. In uncontrolled airspace Airservices air traffic controllers do not provide instructions or guidance to pilots but can provide a Flight Information Service and Traffic Information Service to pilots on request. Where will aircraft fly and will I notice any noise? 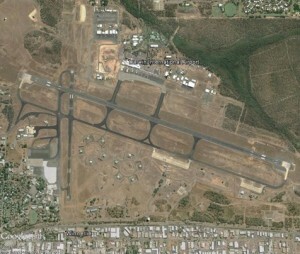 Brisbane West Wellcamp Airport has one runway which is oriented northwest to southeast as shown in the picture below. Take off and landing is generally when aircraft have the greatest noise impact. Aircraft take off and land into the wind, or with minimal tail wind. 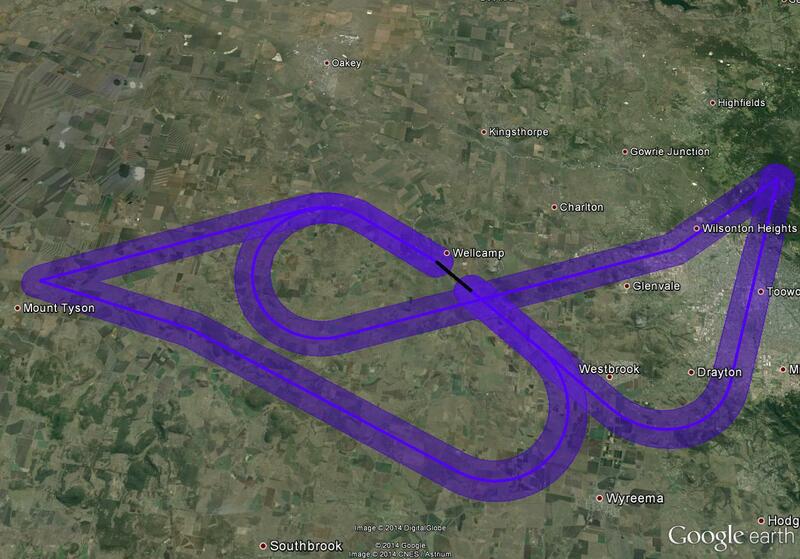 As a result, the wind dictates runway selection which in turn determines the flight paths used. arrive on either Runway 30 or Runway 12 aligning with the runway from approximately seven kilometres away. In bad weather when there is low visibility, scheduled passenger aircraft are expected to depart and arrive using the flight path corridors pictured below. Smaller aircraft will not necessarily fly within these flight path corridors, but are required to be a minimum of 300 metres above any city, town or populated area and 150 metres over other areas as outlined in the Civil Aviation Regulations – REG 157. Purple area shows the flight path corridors where scheduled passenger aircraft are expected to fly when departing from the airport in bad weather, when there is low visibility. Black line shows the runway. Runway numbers are indicated in white. Green lines show flight path corridors where scheduled passenger aircraft are expected to fly when arriving at the airport in bad weather, where there is low visibility. 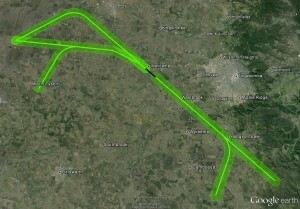 Black line shows the runway. Runway numbers are indicated in white. Runway 12 is the preferred runway for aircraft landing between 2 pm – 7 am (ET). Runway 30 is the preferred runway for aircraft taking-off between 2 pm – 7 am (ET). Where practicable, Runway 12 must be used for aircraft landing between 7 am – 2 pm (ET). Where practicable, Runway 30 must be used for aircraft taking-off between 7 am – 2 pm (ET). Where practicable, minimise night movements, with preference to operation in day period (sunrise to sunset). Where practicable, avoid use of reverse thrust after landing between 7 am and 2 pm. Cathay Pacific Airways Boeing 747-8F aircraft will land at Brisbane West Wellcamp Airport from Sydney and depart for Hong Kong on 23 November 2015. It will be the first time an international flight has departed from Australia’s newest airport and the first time Cathay Pacific Airways has operated a cargo service into an Australian regional centre. It is the intention that regular scheduled freight services will commence at Brisbane West Wellcamp Airport in the first half of 2016. Further details of flight schedules will be made available closer to the date.